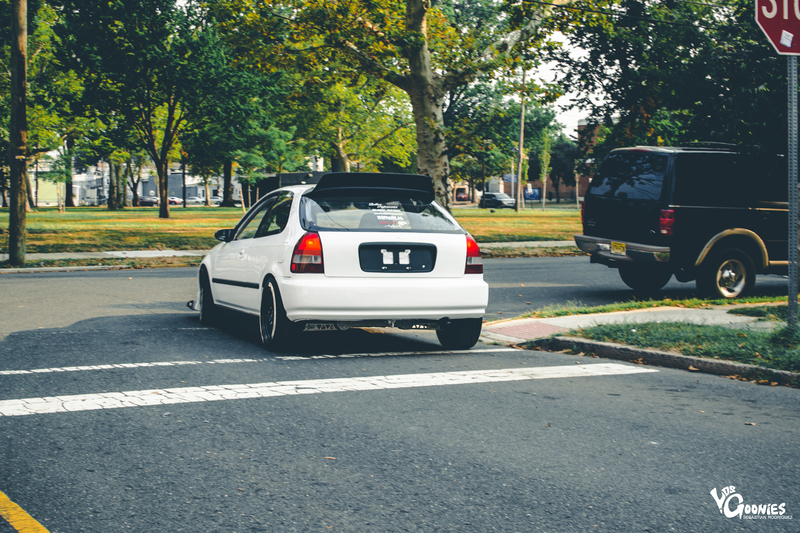 Today’s “Moments in Time” post features Alberto’s newly finished turbo Civic hatch, a timeless build built by himself and his father. This build began only 6 and 1/2 months ago in his fathers garage , Beltico Performance, with intentions to have something you don’t see every day as well as having a daily driver that packed a punch behind the gas pedal. Needless to say, his goals were met and exceeded. 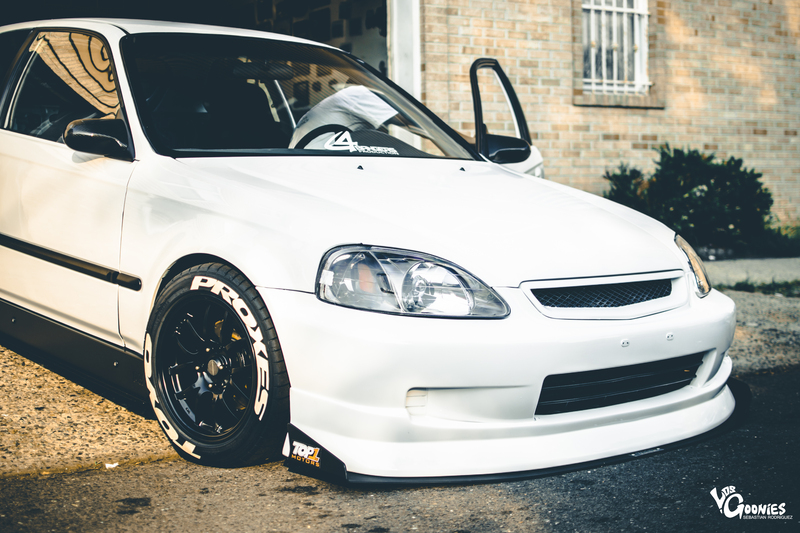 The exterior features a fresh Taffeta white paint job , osaka JDM rear wing, TOP1motors front spiltter, chargespeed lip, CF spoon style mirrors, PCI racing side skirts and Charcoal 949 racing 6ul wheels wrapped in beefy TOYO R1R’s with Tein SS coliovers to keep this beast grounded. Under the hood you’ll find a Precision 55/54 pulsating its JDM b20b. Alberto thanks his main helper, his dad. Who was always there to guide him every step of the way and help with more advanced mechanics, as well as yelling at him quite a bit so that he made the car perfect to his standards. Further more he attributes the success of his build to his supportive girlfriend, Zuanny and his good friend Kevin (@rhdkev) who came in clutch when it was crunch time and sourced out some of the harder to find parts for Alberto. Alberto’s hatch is a perfect example of what happens when you have a vision and your loved ones are there to make sure you achieve it. Interior: F1 spec type4 bucket seats, takata 4 point harness , brand new OEM rug, godspeed X brace , suede armrest & shift boot, NRG quick relase quick w/ steering wheel, K-TUNED drag shifter, Si cluster, OEM air bag delete tray. Engine: JDM b20b , ARP head studs , supertech double springs/retainers & dome valves. Crance cams 101 , Edelbrock Victor X , OmniPower 70mm TB , Hondata 4bar map sensor, hondata s300, AEM regulator, AEM fuel rail, Precision turbo 55/54, Tial 44mm wastegate/ Tial 50mm BOV , Blackworks RAM horn manifold, precision turbo intercooler , 3in IC piping & walboro 255 fuel pump . Suspension: Tein SS coliovers 12k spring rate , BWR lower contronl arms , ASR subframe with swaybar , hardrace camber kits. energy trailing arm bushing.